Last week we asked StoptheDrugWar.org readers to help us make some important decisions about what our organization can financially afford to do as the fight to stop the drug war enters its most critical moment to date. If you didn't see or would like to review last week's appeal, discussing what we need your support for and why it's so important for drug policy reform right now, you can find a copy here. Since we sent that letter, more than 40 supporters have donated or pledged more than $6,500 for our work. Thank you! One of the two specific decisions mentioned was whether we can continue using the high-powered legislative and email list service that has helped us so much the past two years. Along with reliably delivering email to all our subscribers -- a tough job in this time of spam and false spam positives -- this system is what's powered our major new Legislative Center. If you haven't already, please visit this compilation of hundreds of federal and state bills and votes, legislator scorecards, media and voter registration tools and more. To know that we can responsibly afford this service another year, we need to raise another $3,500 between now and Monday. If you haven't already donated to this campaign, would you make a generous donation today for this or other StoptheDrugWar.org programs? It gets thousands of emails on important drug policy issues to members of Congress. While lobbying visits and individually written letters are the most important types of contacts to make, the emails get counted, and if we don't get them there, our opponents will. The letter-writing action alerts get forwarded by our supporters to lots of other people, who sign up to our list through them -- a highly effective way of growing the organization and the movement. It lets us publish federal and state bills and votes -- hundreds of them so far -- categorized by issue, creating a clearinghouse of legislative intelligence gathering on what good trends there are that we can support, what the bad trends are that need to countered and where, who our allies and opponents are. It lets readers like yourself and others look up who your legislators are, how they voted on bills that we've highlighted, who the current candidates are for public office, how things are looking in your and other states. It even lets people look up where to send letters to the editor, and provides help in registering to vote. The system delivers our alerts and newsletters to you reliably, as I mentioned above, a tough job these days. The fight to stop the drug war has entered its most critical moment to date: Support for marijuana legalization has reached 50 percent. Heads of state including the current presidents of Mexico and Colombia have called for alternatives to drug prohibition to be considered. Leading civil rights groups have called for an end to the war on drugs in its current form. And yet -- and yet -- the federal government under President Obama has escalated its campaign to crush California's medical marijuana industry to its broadest and most aggressive level yet. We need your help to decide whether StoptheDrugWar.org -- our movement-building work; our organizational coalitions; our leading online publications like the Drug War Chronicle newsletter that keep the movement, journalists, policymakers and countless others informed and empowered -- can enter this historical moment at full strength. Will you step up today in meeting both the crisis and the phenomenal opportunities? 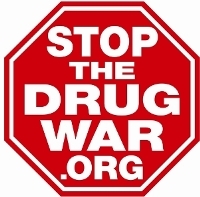 Please make a generous donation to StoptheDrugWar.org -- non-deductible for our lobbying work, or tax-deductible for our educational work -- to help us make these decisions the way they should be. Thank you for standing with us to stop the drug war's cruelties and meet the opportunity this time offers to make a brighter future. And don't get discouraged by the challenges our movement and the cause are currently facing -- time is on our side! One of the things that still remains in the land of myth and misconception is the true nature of addiction. Although this will appear in a Kindle Book that I am working on, simply put; addiction is a self-medication for a genetic based mental illness that has never been effectively diagnosed and treated. This is not a choice. Genetic predisposing factors along with some highly individualized environmental factors combine to set the stage at birth and on to the point of sampling some chemical that appears to help the individual feel better about themselves and the world around them. They may stick with the first chemical as a self-medication or they may "shop around" and discover something/s that tend to work better. The problem is that, with the exception of marijuana for which there is no solid evidence of addictive properties, the chemical/s will make the genetic based neurobiological condition worsen. Wrong medication and a tolerance is developing. Contact with an addiction professional who has a sound science based knowledge of the true nature of addiction and he/she should be able to develop a "broken-brain" repair program using neuronutritional aids and aids to physical well-being as needed. Medication Assisted Treatment may be required in addition to the neuronutritional aids. With the neurochemistry in the brain put in as healthy a condition as possible, then psychotherapy (talk therapy) can begin the process of strengthening the weak neural pathways that ultimately lead to an ever increasing level of functional independence. This is not a cure, but it is an exceptionally positive continuing support of an ever-increasing level of functional independence. The genetic cures are coming but that, as I project it, will not come until 2020 to 2025. Then we can repair the genetic flaws and with a little psychotherapy the individual will move on to a very successful life-style. To continue to put sick people in prison is insane. Why does our society continue with this? Ignorance, fear and a criminal justice system, political mindset, and drug dealers, and cartels powered by "Money, Power, and Greed". Fixing the problem in an appropriate manner takes all the money out of far too many greedy pockets. A lot of that money is a part of our governments own greed. Much goes into the pockets of those who want to stay in power so the laws do not change in favor of reality. Those times are coming to quick end and I think that the individuals involved realize just that. The first step will be the legalization, regulation and taxation of marijuana for adults. 1933 renewed. Now the Feds can collect money legally and then recognize the need for effective intervention and treatment of those who have become addicted. With the genetic cures right around the corner and a realization that current science is going to make them look like crooks as bad as if not worse than the drug cartels they feed into, change must start now! Major change is already starting and DRC is a major part of the change and will continue to push for change. That is why I am a regular financial supporter of this organization and if you really care, you will become a regular financial supporter too. Help sick people get out of prison and stay out and help them get well and stay well. My dad was an alcoholic.I,his first born became a junkie.He had another family and Patrick,his second first born is also a junkie.We hardly ever met and I only found out years later when we were in court together.While you would think that cannabis would be the first drug to be legalised that has not proven to be the case in Europe.Heroin maintenance has been passed in several countries while cannabis legalisation was defeated.It's a matter of damage control.Cannabis just doesn't do any damage.Go figure.Portugal has not only decriminalised all drugs.They have seen big drops in all drug use,especially amongst their young people.So much for the prohibitionist rant that if we legalise, everyone will be a junkie in a few weeks. This posting of 50% is not correct, "Support for marijuana legalization has reached 50 percent. Heads of state including the current presidents of Mexico and Colombia have called for alternatives to drug prohibition to be considered. Leading civil rights groups have called for an end to the war on drugs in its current form. And yet -- and yet -- the federal government under President Obama has escalated its campaign to crush California's medical marijuana industry to its broadest and most aggressive level yet." A matter a fact only around 12% of the South East, supports, this Nation Wide only 7% maybe. You all did not get the memo, the Directive of the International Boycott Of The Arabic Drug Empire has been changed and is now formatted against Government Officials in a movement called Operation Clean Sweep / byMassingale. To vote out all who failed to do their jobs so that criminal investegations can go forward. So now I will show you this Prohibition in its Moral Value Of Life. To Strategically Rebuild America. Why we built a Anti Crime / Anti War Forum with a Health Care Concepts. I am only human and I can not see into all of the issues, but what I do see, I have found that if I allow a person to read and make up their own minds that what I write holds a moral value of truth, then they add there heart to it, in disagreement or their concepts of what if, but what is most important is a balance is formed. 1st Debit Ceil Issue, WAR-We as a people world wide are against War, some say a unnecessary evil. But still we have War. This issue with the Afghan War, The year is in the 1970's United States help Bin Laden in Afghan to defeat Russia, and by the 80's the War ended. Around 1989 not long after, Bin Laden orders the first strike against the World Trade -Twin Towers, then 9/11. Now we are at War in Afghan, the Taliban has portrayed all American's as a aggressive Specise with a foot hold on their territory. But to see photos of American Military Personal Shoot protecting Poppy Plants. I am sorry but this is true. A War fought to control a Heroin Empire. 2nd Debit Issue, between Canada and the USA, 1.2 million people died from Oxy Heroin. June 30, 2011, C-Span-3 on TV, the Capital Hill, Director Senator Sheldon, Senate Judiciary Sub Committee for Crime and Terrorism. Announcement Oxy. Heroin, this Heroin Health Care Concept, in 2007 that 27,000 Americans died, from this Opioid.So if this Oxy Herion is so good for the economy, where is the money ? I do assure you this is true, greed of money and no fate for people stuck with pain. A lot of issues I do not support Obama in, but this of what he did I do support. So did you get it,in 2007, 27000 people died because of the Health Care Concept for pain and as of yet no recall, so whats wrong with the picture ?